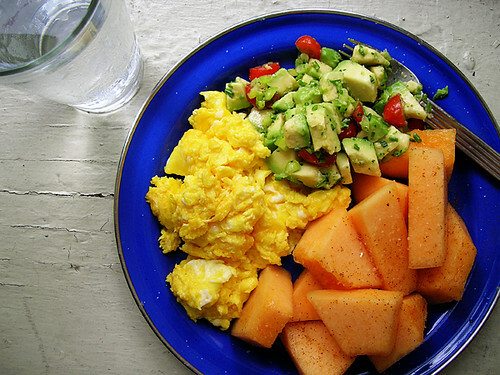 Cheesy scrambled eggs, avocado tomato salsa, chili-salted cantaloupe, and water. Coffee already consumed. I'm actually a little proud of this one. I puzzled it out yesterday while I was doing some math at work. I mean, it's scrambled eggs. It was going to be scrambled eggs and cantaloupe, which I eat every other day for breakfast. But bout day breakfast should be special, actually, I came up with this whole other idea for fried eggs with crispy brussels sprouts and shallots on mashed potatoes, another day, when I don't have two-thirds of a plate already composed. Avocado could be the third third; but eggs are plain (this was before I found the little bit of cheese) and cantaloupe is plain, this plate needs a little fancy at this point. I didn't want to go to the grocery after work, so I had to visualize the contents of my refrigerator and see what would do for all the parts of a salsa: avocado I always have, cherry tomatoes I always have, sure why not, parsley I have in the freezer. Annnd I had a container of already cut up hungarian hot peppers, surplus from yesterday's chicken stew. I regretfully thought about the shallots I used up, if only I had kept one little shallot. But then I remembered I had chives from the fishcakes, click! And key lime juice. And then I found the cheese. And then I might as well put a little chili and salt on the cantaloupe.